Aug. 31- Sept. 3, 7 p.m. to 5 a.m.
Sept. 4, 7 p.m. to 12 a.m.
Those are the dates and times the Idaho Transportation Department will be performing maintenance at the intersection of US 95 and Ironwood, meaning they'll be doing paving. Barricades will be placed at the intersection preventing through traffic on Ironwood. Detours will be marked. The far right lane heading south from I-90 will be open for access to the Kootenai Medical Center. So you've got a lot of stuff to carry, but only a tiny rack on your bike. What to do? Maybe drive to work that day or to do your errands? WRONG! You need the new Danish 'Cargo Bike.' Here's the info from the 'Bike Hugger' blog. Have you seen this video yet? It's a public service announcement out of the UK about texting while driving that's making the rounds of the internet right now. Just a warning, there's blood involved, but not slaher-movie amounts or anything. Avoid eastbound I90 starting at Liberty Lake. A crash about a mile east of Stateline has the freeway backed up for several miles, all the way to Liberty Lake. No word yet what caused the crash or if anyone was injured. After several months, the KMPO Transit Center Location Study is near completion. A final draft report is now available to review. Here's a link to the report, which contains some background on the need for a transit center, etc. Any time I ask, 'What would get you to ride your bike to work more often?' one of the first answers I get is, 'More bike parking.' 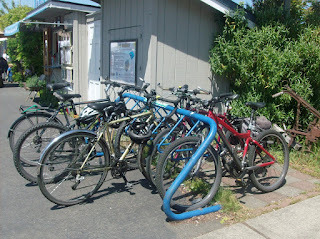 We're getting better about providing bike parking in our area, but there's still a lot needed. In fact, we're no where near as progressive as the Japanese city in this video, where they park bikes underground! Check it out. And thanks to Charlie from the North Idaho Centennial Trail Foundation for sending this to me. Fired Idaho Transportation Director Pam Lowe says she was fired because she planned to cut back a big contract, despite pressure from the governor's office not to. Lowe says the legislature directed her to reduce the cost but the governor's office told her the opposite. Here's the latest. The Trail of the Hiawatha was super – if you haven’t done it before, you need to. Its really a good time and incredible scenery - plus the world’s tamest and chubbiest chipmunks. They were eating out of our hands. We saw one kid who had four of them in his lap! 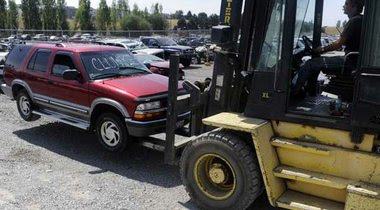 Cash for Clunkers generated nearly 700,000 new car sales and ended under its $3 billion budget, the Transportation Department announced today. Japanese automakers Toyota, Honda and Nissan accounted for 41% of the new vehicle sales, with the Toyota Corolla being the most popular new vehicle purchased under the program, followed by the Honda Civic, Toyota Camry and Ford Focus. Here's more statistics from the program from the Spokesman-Review. While this program definetely boosted the auto industry and the economy (by putting people to work) this year, what this article doesn't say is that many economists are now worried that the auto industry is going to tank again next year and possibly the year after, because few people will be buying cars. What's your take? Any other major pros or cons you see coming out of this we haven't talked about? Looks like the Idaho Transportation Department may have a fight on their hands. Former ITD director Pamela Lowe is seeking damages from the state for improper termination and gender discrimination. Among her claims: One member of the ITD board said "no little girl would be able to run this department." Here's the story from the Idaho Statesman. Why Do Anything Half Way? 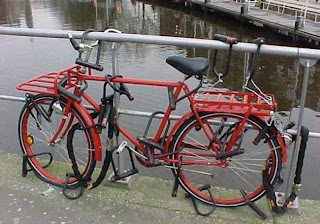 Thanks to blogger Holly who suggested this method of keeping your bike safe in response to the post below about a stolen bike flyer. Recognize these guys? No, it's not the members of a 1960's-era folk singing group reunited for one last tour. 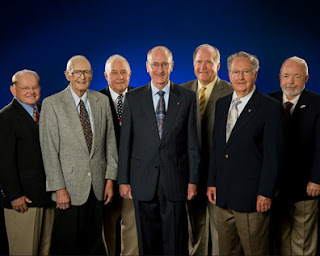 This is the seven-member Idaho Transportation Board (which badly needs a female member, by the way). 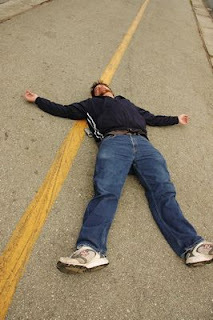 Just thought you might want to know who oversees the Idaho Transportation Department. The Board meets once a month to oversee the operations of the ITD, establish state transportation policy, and guide the planning, development, and management of the transportation network. Any questions? Here's more about them and their responsibilities. 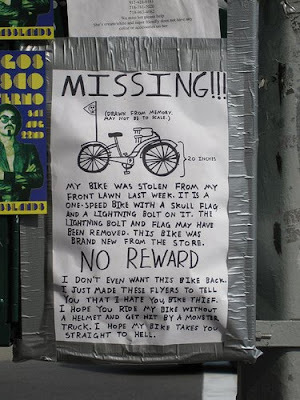 This missing bike flyer was allegedly posted in Williamsburg, VA. I stole the picture from bikehugger.com 'cause it made me laugh. Cash for Clunkers may be out of money, but another federal program that most people don't know about provides incentives even more substantial to buyers. The catch? The vehicle you buy under this program must be plug-in electric vehicles. Here's the story. It's the best views Coeur d'Alene has to offer, so why is the area being used to park cars? That's what the Mayors' Institute on City Design resource team is wondering about Independence Point. The resource team, made up of world-recognized designers, is in town to help with the education corridor expansion project. But what caught there eye was the acre of parking next to the city's showpiece lake. Now they're strongly recommending that parking be filled in- with grass. Here's the story from the Coeur d'Alene Press. Beginning Tuesday, August 25th, the lower entrance of Coeur d'Alene City Hall will be closed so that city crews can install an ADA accessible ramp in the lower lot. This ramp will replace the asphalt ramp that is now in place. This access will be closed for two (2) days during construction. Once the concrete is finished, crews will replace asphalt and posts for signage, as well as re-stripe the lower lot. Both upper entrances to City Hall – from the Library parking lot and from 8th Street – will be open for business. Let me make it clear that KMPO in no way endorses vandalism, but it's Wednesday and you've made it this far so you deserve a treat.Here's a gallery of 'Amusingly Defaced Street Signs. Please don't try to make your own at home. What Would Get You To Ride To Work More Often? Thanks to Holly for sending me this article. 'Slate' recently asked, "What would it take to get more people to bike to work?" and came up with the answer "more bike parking." It makes sense when you think about it, and it applies to cars so why not bikes? Studies show that a large percentage of commuters who drive to work alone in their car each day have a free, assured parking spot. So if you knew you had a safe, guaranteed place to park your bike each day, would you ride more? Last week I blogged about a letter to the editor of the Coeur d'Alene Press that said that parking is at a premium at North Idaho College. In response to that letter, an editorial in today's issue of the Press calls for raising the price of a parking permit. Apparently, a permit is only $20- for an entire year!Here's the editorial. What's Worse; Drinking & Driving Or Talking & Driving? For those of you who just looked at your watch and thought, "When is this &^%$ day going to get over already??" here's a little something to entertain you while you're killing time until 5:00. What's more dangerous, drinking and driving or talking on the phone and driving? The folks at the publication 'Mobile' took one for the team and did a very non-scientific experiment to find the answer so that you don't have to. Their goal: To find out if their subject could stay on the road while besotted or blathering. Here's the results. If you're like everyone else I know, you lie awake at night wondering what KMPO has been up to lately. Well here's your chance to find out. You can check out the latest KMPO newsletter here to see what projects we've been doing this summer and what's coming up this fall. This newsletter comes out quarterly so it's actually the July newsletter, I've just been slow getting the link on here. I can assure you that not a lot has changed in two weeks though. Tucked away on page 4 of Section C of the Sunday, July 26 edition of The Press was an article titled, "Enrollment Growing at NIC." The author, NIC President Priscilla Bell, listed the good news/bad news associated with the projected 28 percent enrollment increase for fall 2009 compared to fall 2008. However, the biggest piece of bad news was not addressed in her article: Where are all those students going to park? Parking at NIC was already a nightmare last year, especially during the winter when large sections of some lots were used as dumping areas for snow. My daughter commuted to NIC last spring, and reported that a diligent search of all on-campus parking lots would often reveal just one or perhaps two empty spots, usually next to someone who had parked very badly. Arriving at 7 a.m. seems to be the only way to be sure of finding a parking spot. Just a few years ago, students were allowed to park at Memorial Field or in the museum parking lot, and an NIC shuttle bus took them to the campus. Will this become an option again this year? Does CityLink provide a direct (or nearly-direct) route from a large off-campus parking area, such as its Riverstone bus stop, to NIC and back? How about the former lumber mill site? Will some of that area be sufficiently cleared of rubble to be used as a parking lot? Many NIC students drive an hour or more just to reach the campus. Car pooling isn't always a viable option. Riding a bicycle is out of the question. So I repeat: Where is this rapidly-increasing student body going to park? What arrangements have been made to accommodate the huge demand that will exist for parking spaces less than two weeks from now? Anyone? I have only been to NIC during the school day a couple times recently, and as a 'guest' (non-student) had no problem finding parking in the front row spots marked 'Guests only.' How about you folks who go there or know people who do though? Is this an accurate assessment of the NIC parking situation? Tax Soda Or Candy To Pay For Trails? Among the ideas the state Parks Board threw out to fill the hole when their gas tax funding for trails goes away: Diverting sales taxes from sales of boats and off-road vehicles to trails; imposing a new tax on sporting goods to fund recreation; and slapping an extra tax on soda pop or candy, which 19 states already do. Here are some other ideas from the Parks Board as well. It sounds like a dream but it's not- the commuter bike of the future will count calories as you pedal, play music, and use a solar-powered motor when you get tired. Olympic cyclist Chris Boardman has designed a bike that includes an 'unbreakable' locking device that allows only the owner to open it via fingerprint recognition, spoke-less wheels that make the bike more aerodynamic, and puncture-proof self-inflating tires. 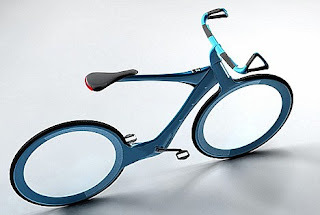 Here's more on the bike we could all be riding in a couple years. Costly work on a Coeur d'Alene road has left a water and sewer association deplete of funds for other major projects, according to the president of the Woodland Shores Water and Sewer Association (WSWSA). A series of mishaps during construction on Watson Road near Rockford Bay allegedly left the Association broke. Here's the story from the Coeur d'Alene Press. An Idaho legislative task force is leaning heavily toward undoing an unpopular law passed this year to raid recreational trail funding to shift the money to road repairs. 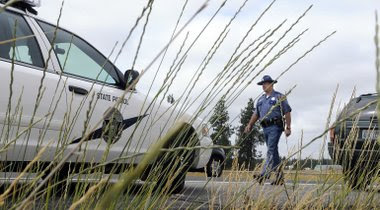 On July 1, 2010, all gas tax money that goes to the state Parks and Recreation Department for trails and to the Idaho State Police for highway patrol will shift to the Transportation Department for road work. The legislative task force was set up to identify alternative funding for parks and ISP. But overwhelming public testimony may change that. Here's the story. Join Olympic gold medalist Kristin Armstrong for a bicycling event benefiting the North Idaho Centennial trail. The Blue Cruise Charity Ride Coeur d’Alene on August 15th includes 15-, 30- and 62-mile fun rides, an after-ride picnic and a health fair. The ride starts and finishes at North Idaho College in Coeur d’Alene. For more information and how to register, here's a link to the Blue Cruise website. Betsy Russell at the Spokesman Review's Eye on Boise blog has been busy today. She has posted several blog strings about the tug of war over Idaho's gas tax revenue that is taking place down in Boise this week. A special joint legislative task force has entertained some very interesting discussions. I was going to link all of them here, but Dave Oliveria of the S-R's Huckleberries blog has already done that, so I will just link to him here. If you recall the Idaho State Legislature created two joint legislative task forces. One of those task forces is charged with developing recommendations on how to generate new revenue for the state parks department and the Idaho State Patrol. The legislature decided to quit using gas tax revenue to fund those departments and temporarily funded them out of the general fund this year. Now they need to find a permanent revenue stream to keep those departments operating. That could be difficult, according the Spokesman Review's Eye on Boise. Betsy Russell covered the first task force meeting this week in Boise. Apparently, the state revenues that were anticipated this year aren't coming in as high as they expected. Looks like this task force is in for some heavy discussions. The other task force, which is charged with finding permanent funding for the Idaho Transportation Department met last week just to get organized. It appears they are going to be having a tough time as well. The Spokesman Review did a great piece on the traffic fatalities that have plagued our region recently. While driving conditions have been treacherous over the past couple of winters, it seems to me that drivers are actually worse in the summer months. Maybe it's a false sense of security people have. All of these accidents are tragic, but the one that haunts me right now is the accident last week on Magnesium. A woman lost her life prematurely only because another person felt a need to speed so fast that he lost control of his vehicle and wound up killing an innocent person. Be careful out there... Here is the story. The letter below ran in the Coeur d'Alene Press today. 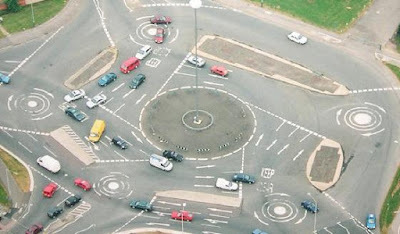 This guy clearly does not like roundabouts. Certainly things could be worse (like in the photo above). I am no engineer, but I like roundabouts -- especially in residential areas because they tend to calm traffic down. Plus they are easier to navigate than a four-way stop. Several weeks ago the citizens of Dalton Gardens received notices in the mail regarding a roundabout that would be built at the intersection of Fourth and Hanley. This structure was to be built in this location primarily as a safety factor that would reduce accidents. The notification stressed that this project would require several months to complete and require rerouting of Fourth Street as well as the Hanley traffic. In the interim I have had numerous discussions with neighbors regarding the feasibility of this questionable project. To this point in time I have not found anyone who feels it is beneficial in any way to the citizens of Dalton Gardens, or our neighbors. Were our citizens informed during the planning stages of this fanciful merry-go-round? I don't recall receiving any notice informing the citizenry of such a plan to be discussed in Dalton City Hall Chambers. Can someone please tell me what the cost of this misplaced monstrosity will be? Was it part of a stimulus package that really won't cost the taxpayers anything? Who was the brain child engineer who drew up the plans to place this contrivance in such a location as this? Would the genius responsible for this premeditated pipe dream please step forward to accept such accolades as we may bestow on him? Here is the best of both worlds! Okay, I am seriously considering buying one of these motors for one of my bikes. It just adds a little more convenience to the long commute. I commute from Post Falls to downtown Spokane daily and when I take my bike, I usually take the bus for a portion of the trip to save time. But last month I had a bus driver tell me she was going to refuse to take my bike because the wheel base is a little longer that an ordinary bike and it doesn't fit completely down in the carrier rack. Even though I have been riding the bus with that bike for most of this year without any problems at all, she wasn't hearing it. If I buy one of these motors, I won't need STA. I could still cut my time down when I need to or I can choose to pedal all the way home when I have the time. 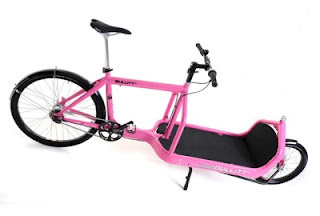 Sure, it'll add some weight to the bike, but the motor has an independent drive system so it won't drag you down if you still want to pedal...I'll keep you posted on this. A 19-year-old girl filed a federal lawsuit against the Cd'A Police Department for sexual assault during a traffic stop last year. There have been some pretty sharp opinions on this suit since the Coeur d'Alene Press published this story on Monday. Here is a link to the full length video (45 minutes long). If you have nothing better to do, there are quite afew comments posted under the story and the video. The North Idaho Centennial Trail Association would like to thank all the people who took advantage of the bike corral at last weekend's Art on the Green event. Association manager Charlie Miller said they had a surprisingly high level of use, considering they put it together on short notice. So thanks for showing your support for biking and the Centennial Trail! 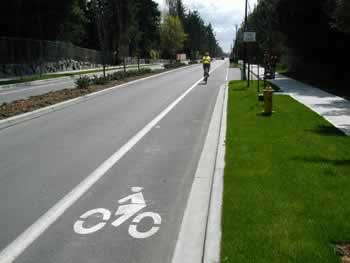 On Monday the Cd'A Press ran a story about the new bike lanes that were built on 15th Street in Post Falls. The residents along the new bike corridor were hoping to be allowed to park in the bike lanes during non-school hours, but the Post Falls City Council decided not to allow the parking. This seems to be a growing problem as more and more people take to bicycles as a serious form of transportation. You can read the story here. This story in today's Spokesman Review is very interesting. I wonder if the used car folks are serious about this or just bellyaching because sales slowed a bit since the cash for clunkers program kicked in. It worries me to think that a lot of perfectly good vehicles will be destroyed. Those are usually the cars I buy because I commute to Spokane everyday. I carpool with my wife and ride my bile as much as possible, but still I rack the miles fairly quickly, so buying new just doesn't make sense for me. Does this unintended dynamic concern you? 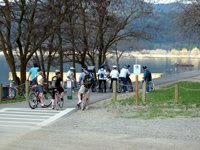 Planning a ride on the Trail of the Coeur d'Alenes? There will be a series of late summer free concerts in the city park at Harrison, Idaho, Saturdays from 2 to 5 p.m. The shady park overlooks the Trail of the Coeur d'Alenes and public swimming beach so you can not only enjoy the trail, but the bands also. Bands are listed, along with other happenings, at the Southlake Coeur d'Alene Facebook page. POST FALLS -- Bike and pedestrian improvements to 15th Avenue may be complete, but safety concerns still linger. Residents along the stretch from Spokane to Idaho streets want parking to be allowed on one side of the street during non-school hours because the widening project consumed city right of way that was formerly used for parking in front of homes. The City Council tonight will accept public comment as to whether or not the signage prohibiting parking within the bike lane should remain or be removed. Post Falls School Superintendent Jerry Keane said the school district has concerns if parking is allowed. "It appears to me that any person parking on either side of the street will actually have part of their vehicle parked in the designated driving lane," Keane wrote in letter to the city. "Having vehicles parked in the driving lane will cause a hardship for our buses, especially during the winter. "While it would be difficult to quantify, there is little doubt that honoring the request to park on the street will reduce the positive impact that this project will have for citizen and student bikers as well." Post Falls Middle School is just off 15th Avenue. Bike lanes have been added in both directions on the stretch. The council in April decided to postpone the residents' request to park, then accept public comment after project completion. More than 50 residents signed a petition on the request. City staff earlier opposed the request due to safety reasons and possibly jeopardizing a federal grant for the project. City officials say illegal parking in bike lanes -- and enforcement difficulties that come with it -- is already a citywide problem. So many people are still calling me and the hospital, I thought I'd ask you to put this in the Letters to the Editor. Frank Henderson was in the hospital for only a week recovering from quadruple bypass surgery. He was doing so good in just that week's time that they sent him home to recuperate. He is doing just great, still has a lot of therapy, but is amazing everyone. There is no way that I could possibly answer all of the calls and cards he received, so I just want everyone to know how he is doing. We want to thank everyone for all of your concerns, cards, plants and flowers. He would love to see his friends, so give him a call and stop by for a visit. Come on...it's the law! How hard is that to understand? I just have to rant a little after reading the letters to the editor on the Coeur d'Alene Press website this morning. Two letters really struck a nerve. Sure, I may be a little testy because its Monday, but come on folks. Can you believe this guy whining about getting a ticket? 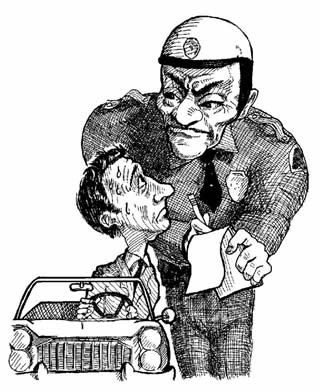 He admits he broke the law, but wonders why the cop gave him a ticket? Read for yourself here. Then there is this guy, who I totally agree with. He is dressing down a similar whiner who got ticketed for having a noisy car. Some kid wrote a letter to the editor a few days back blasting the cops for "profiling noisy cars." Ha! 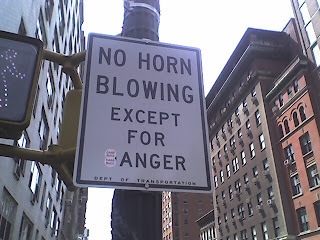 I hate noisy cars! I keep asking myself when did we make the switch from "mufflers" to these so-called "exhaust systems" that make more noise than no muffler at all? Anyway, here is the letter. Okay...It's not the sexiest of elections, but voting for competent highway district commissioners is serious business. In Idaho, these are the folks that make sure your regional road network is taken care of. They are the people who make sure those pot holes are filled and the roads are plowed. They are the ones who make sure your road dollars are put to the highest and best use. These positions are not often contested, and they are rarely politically charged. But it looks like there maybe a couple of pretty good horse races tomorrow. In the Post Falls Highway District there are four people vying for one seat, and in the Worley Highway District two people are angling for a position on the board.